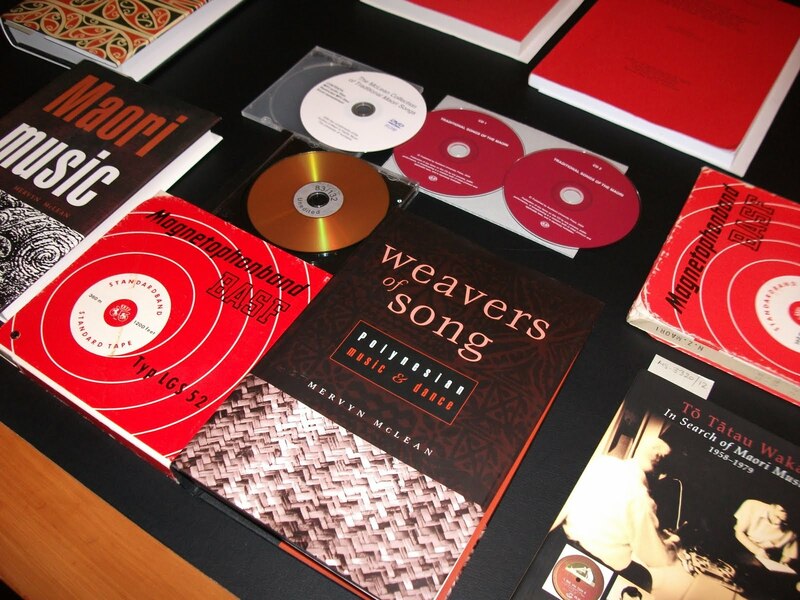 Hocken Collections in the news! 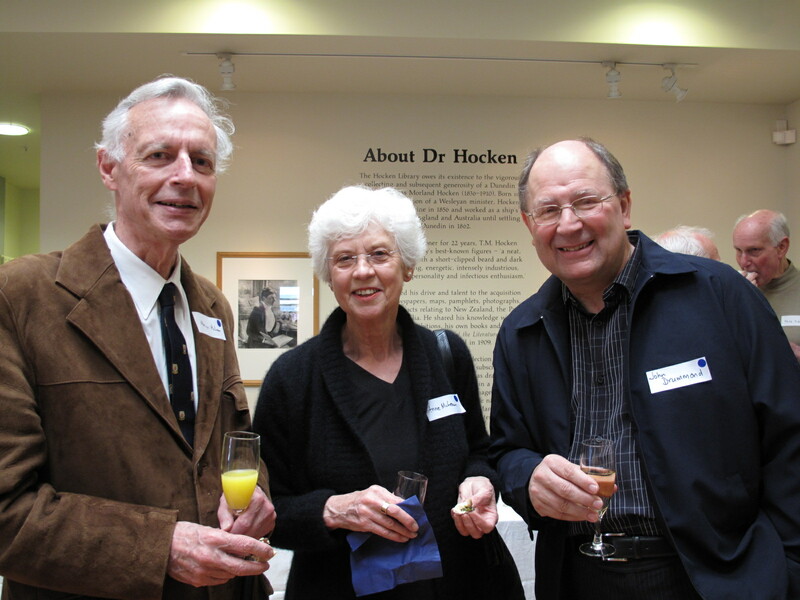 Well actually not so much the Hocken in the news but the work of some of the wonderful researchers who use the Hocken Collections. Firstly Professor Judy Bennett of the Otago History Department and Tim Bayliss-Smith of St John’s College Cambridge have published a very readable book based on the diary of William Crossan, which is held here at the Hocken. Crossan was a copra trader in the Solomon Islands in 1885-6. Read about it in the Otago Bulletin. And you can download and read the book from the Australian University E-Press too. Next two stories on our own staff member Dr Ali Clarke, Ali works for the Hocken part-time as a Reference Assistant, and is also an historian with three monographs and several journal articles and book chapters to her name. And don’t forget to check out Ali’s research blog University of Otago 1869-2019 – wiritng a history. And there is also Dr Jenny Burchell who has been researching the history of the City Choir Dunedin for a book to be published next year. See the story in the Otago Daily Times. Rapa Nui (Easter Island) has never exactly been a popular topic for researchers at the Hocken as far as I know but in 2009, Dr Paul Horley of Yuri Fedkovych Chernivtsi National University in Ukraine wrote to inquire as to whether we had any photographs of rongorongo tablets from this small island on the other side of the Pacific. I began my search feeling far from optimistic and was surprised to find that we hold ten albumen prints of Easter Island artefacts. What is more, one of them turned out to be of exactly what Paul Horley was looking for. Little over two dozen rongorongo tablets have been documented around the world (some are of questionable authenticity). They are remains of a unique script thought to have evolved on the island sometime between the thirteenth and seventeenth centuries. Catholic missionaries in the mid nineteenth century first recognised their value as evidence of an advanced Polynesian civilisation. By then the indigenous people no longer knew the meaning of the glyphs carved on wood but they called these tablets ‘kohau rongorongo’ or ‘singing wood’ and scholars continue to debate their translation. Dr Horley identified the Hocken photograph as being of the tablet known as Keiti, which has been interpreted in relation to the Rapa Nui lunar calendar in three recent papers published in the Journal de la Societe des Oceanistes in 2011. The original artefact, which measured 39 x 13 cm, was sent by Tepano Jaussen, Bishop of Tahiti, to Europe in 1888 and destroyed in a fire during World War I at the library of l’Université Catholique at Louvain, Belgium. Just a few original photographs of Keiti remain and how the Hocken came to hold one remains a mystery in itself. Paul Horley, who continues to research the subject, knows of two sets of photographs taken before the tablet was destroyed. ‘One set of photographs was made under direct light with the glyphs filled in with a white substance to improve the contrast (these images are in the collection of the Congregation of the Sacred Hears of Jesus and Mary, Rome). The second set of photographs was made under slanted light, and the photograph that you have, showing the recto side of the tablet, belongs to this set. The other copies of these pictures can be found in the National Anthropological Archives, Smithsonian Institution; Library and Archives of the Bernice P. Bishop Museum, Honolulu; Bancroft Library at the University of California, Berkeley. Some of these images are later prints…’. One piece of information that we have been able to add to the store of knowledge is that the Hocken photograph of Keiti may have been taken by the photographer Charles Spitz (1857-1894), who had a studio in Papeete. As mentioned above, the print is one of a collection of ten and the mounts of some of the others are stamped with the words ‘Collection of J.L. Young’. James Lyle Young (1849-1929) lived in Papeete from 1882 to 1929 while working in the trading business. 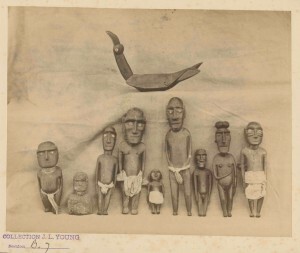 He collected and later gave most of the other Easter Island artefacts recorded in the photographs to the Bishop Museum in Honolulu in 1920 and they also hold prints of these. Several of the Hocken photographs reveal parts of Spitz’s studio mark either showing through from the back or shining on the surface. The collection of Easter Island photographs at the Hocken bear no old accession numbers so one can only guess about how they entered the collection. A possible source was H.D. Skinner, best known as a past Curator and Director of the Otago Museum but also one-time Librarian of the Hocken (1919-1926). The Museum then housed the Library and is another Dunedin institution fortunate enough to hold a Rapa Nui treasure in the form of a moai (large stone statue), registered in 1929.
 http://en.wikipedia.org/wiki/Rongorongo (accessed 22 July 2013). For a comprehensive history see Steven Roger Fischer, Rongorongo, the Easter Island Script: history, tradition, texts, Oxford, 1997. Werner Wolff, ‘The Mystery of the Easter Island Script’, Journal of the Polynesian Society, 54, no.1 (1945), p.1. Rafal M. Wieczorek, ‘Astronomical Content in Rongorongo Tablet Keiti’, Journal de la Société des Océanistes, 132 (2011), pp. 5-16; Paul Horley, ‘Lunar calendar in rongorongo texts and rock art of Easter Island’, Journal de la Société des Océanistes, 132 (2011), pp. 17-37; Konstantin Pozdniakov, ‘Tablet Keiti and calendar-like structures in Rapanui script’, Journal de la Société des Océanistes, 132 (2011), pp. 39-74. Paul Horley to the writer, email correspondence 10 April 2013. Biographical note, James Lyle Young – Papers, 1879-1929, State Library of New South Wales online catalogue. Moira White to the writer, email correspondence 3 May 2013.